This document is for assistance with Clinical Trial Navigation. 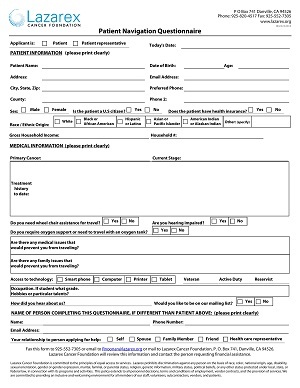 Use this form if you would like our help identifying clinical trial options for yourself or on behalf of someone else. If you have questions please contact Lazarex Cancer Foundation directly for assistance with clinical trial expenses or for help with clinical trial identification.